Do you ever find yourself struggling to reach your goals? You write affirmations, you do vision boards and almost everything to help visualize the ideal world you want for yourself, and after all that you still feel unfilled. In my recent interview with Erin Stutland the author of a new book entitled “Mantras in Motion” I really believe she had created something that has tremendous merit and power to assist everyone in obtaining their ideal life, but in a very unique way. Erin states that by repeating positive mantras with movement, you will become more mindful and stay in the moment helping to prevent negative thinking. You also allow your positive mantras to take up all your mind space, not giving negative thoughts room to exist, while using every once of your energy in your body and voice to create your best life. In Erin program, Mantras in Motion she offers nine foundational mantras, along with stories from her own life and those of her clients, a meditation or visualization, a journaling exercise, and easy movement to accompany the mantra to enhance its resonant power. Here 14 day program helps to infuse the power of movement, mantras, and self-reflection into your everyday routine. 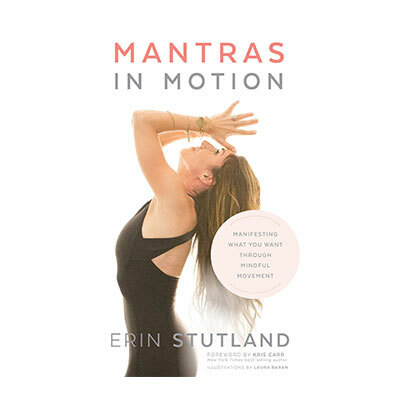 Please enjoy this great interview with author Erin Stutland about her new book “Mantras in Motion.” To learn more about her program and book please click her to be directed to her website, or here to follow her on Facebook.